A family fossil hunt has shone a light on the pre-history of the Severn Vales and bones that have been buried in South Gloucestershire for millions of years. The hunt took place at Manor Farm Quarry near Aust on Sunday 24 July. It was hosted by South Gloucestershire Council’s Heritage Lottery funded A Forgotten Landscape project. 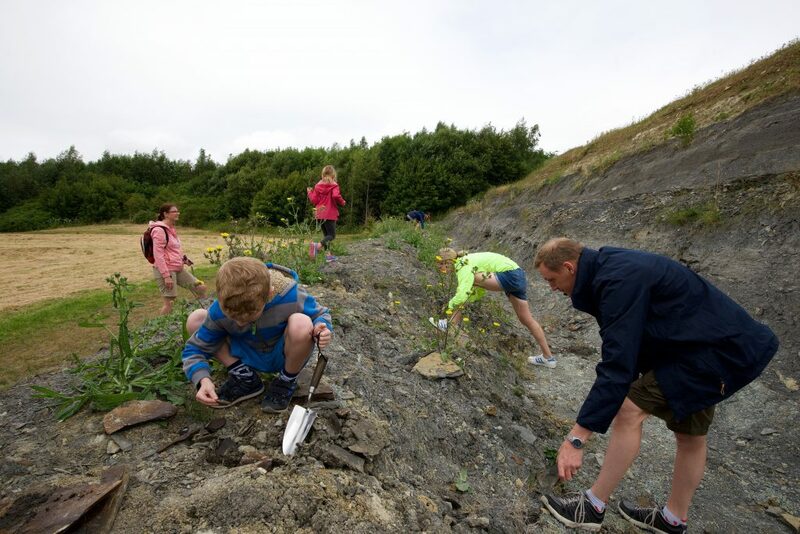 The event was held to celebrate the restoration of the quarry face, where fossil-rich terraces have been cleared of vegetation to allow continued use of the site for research and for visits. Over the years, hundreds of fossil remains have been recovered from the Manor Farm Quarry beds including ichthyosaur, plesiosaur and pterosaurs. Manor Farm Quarry and Aust Cliff are designated Regionally Important Geological Sites (RIGS) and also considered nationally important, as they include the best site in Britain for late Triassic/early Jurassic marine reptile and insect fossils. The collections of fossils, known as the ‘bone bed’, dates back some 210 million years to when Europe formed part of a large land mass on the equator and was a landscape of mudflats, sandbanks and warm tropical lagoons. Manor Farm Quarry is privately owned and access is strictly through organised events only and with the kind permission of the owners.